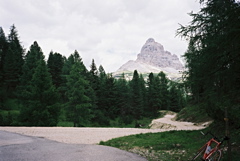 This is on the alternative road to the Tre Cime di Lavaredo road. This road leads to Monte Piana and is very steep in places. You are not allowed to use this road with any vehicle including a bicycle since 1998. However, this is mostly to make room for the tourists being driven up in jeeps and they may not be very angry on you given that you make sure to make room for the jeeps (which is not easy). However, the “wrath” of the road itself will be enough to turn most cyclists away. The old road is not considered practicable by cars and cyclists and they have built a new road meeting the old one at Forcella Àuta/Alta (1984m). The new road is built on an old jeep track/path that has been used for very long. Even if the new road is very fine and apart from two short flat stretches totally asphalted, there are asphalted ramps at 29% with thick layers of gravel on it (outside the wheel tracks), making it nearly impossible to use with any kind of bicycle. The old road (even if badly hurt by old landslides and with fine ramps of up to 20%) is in fact easier to use with a bicycle (contrary to what the jeep drivers there think). To reach even the first pass, Forcella Bassa (1876m), just right on the new road at the first road fork, you will have to traverse around 200m of (good) gravel road. Then there are short stretches of good gravel on both roads at a few places. The new road passes Forcella de Mèdo/di Mezzo (not too obvious). Other comments The asphalt road goes to Rifugio Bois at Monte Piana (2205m) and it is 5.3 km to the rifugio from Misurina (6.3 km to the top of the mountain where the gravel road ends). Monte Piana has many relics from the first world war and is a popular place to visit by tourists. The stretch from Forcella Àuta/Alta to Monte Piana should have an inclination at up to 30%, but I have not cycled this last bit to find out. Still it is probably a very good idea to go up to the top for splendid views of the surrounding mountains. You should not miss to climb the justly more popular road while up here to Forcella Longères (Tre Cime di Lavaredo/Drei Zinnen) (2320m). There is a good water tap at Misurina (on the east side of the road).